A pair of Noritake vases hand painted with gilt relief. The pair date to 1910 and epitomize the quality that is synonymous with this factory. In perfect condition. 23cms height. 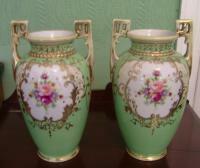 A pair of Famille-Verte Noritake vases. They are hand-painted over a beautiful light green glaze with good quality gilding work. The base has the markings Noritake Made in Japan and the factory stamp.